Frequently asked cheese questions – buying cheese online from The Courtyard Dairy. These are a few of the most common questions about cheese that usually crop up. If you have any other cheese questions (or any on mail order of cheese! ), please email andy.s@thecourtyarddairy.co.uk or phone 01729 823 291. You’ll find lots of tips and advice on creating the ultimate a cheeseboard, cheese rinds, pairing cheese and wine, and much more, on the Learn About Cheese page. If you are ordering a Cheese Wedding Cake, be sure to check out the FAQ on Cheese Wedding Cakes. For orders under £55, delivery costs £5.95, for a next-day, overnight courier service (essential so the cheese is kept cold) to England, Wales and central Scotland. Delivery is free on orders over £55. For more details, please see the delivery page. Once a cheese is cut it will start to deteriorate, in part because the rind, which has built up a natural barrier to the elements, has been breached. The nature of hard cheese means that it will deteriorate slower than soft or blue cheese. When cheese is ordered from The Courtyard Dairy it is freshly cut on the day of dispatch and carefully wrapped in waxed paper. To be enjoyed at its best, each piece of cheese should be eaten within two weeks of receipt. Whole individual cheeses have a minimum of two weeks at their best. Wrapping in waxed paper, and regularly changing the wrapping, helps to slow the deterioration of cheese. Vacuum-packing or gas-flushing in a protective environment will help cheese to last longer, but unfortunately these processes can greatly affect the taste and texture of the cheese. Which is why The Courtyard Dairy cuts each cheese to order and carefully wraps it in waxed paper. How should I keep the cheese, and in what should I wrap it? Store your cheese in a humid, cool condition. In the modern home the fridge is often the best place, although you may want to keep it in a sealed container inside the fridge to prevent it from drying out and getting tainted by other items. A cool larder or cellar (8°-12°C) can be a better place to store cheese, particularly if it’s a hard cheese. In all cases you should wrap the cut face of the cheese as closely as possible, to stop mould developing. If mould does start to develop, however, remember that cheese and mould are ‘best friends’ so you can simply trim or scrape it off. Waxed paper is best for wrapping cheese. Clingfilm is alright as second-best, but remember to use fresh Clingfilm every time you unwrap and re-wrap the cheese, making sure as much air is expelled as possible. Finally, always remember to serve your cheese at room temperature (remove it from its cold place of storage a few hours before eating) – cold cheese will not have the depth of flavour you expect or require. See Learn About Cheese for more details on how best to serve, cut and store cheese. What is the difference between vegetarian and non-vegetarian cheese? Rennet is an enzyme used to coagulate milk, an essential part of the cheese-making process. This is often obtained from the fourth stomach of an unweaned calf (including veal calves) and is thus not suitable for vegetarians. Special vegetarian rennet able to coagulate milk in the same way can be produced artificially by fermenting and purifying moulds in a laboratory or by using a GMO organism (yeast, bacteria or mould) to produce the rennet enzyme. These ‘vegetarian rennets’ are used in many cheeses, but not often found in Continental varieties or traditional British cheeses. 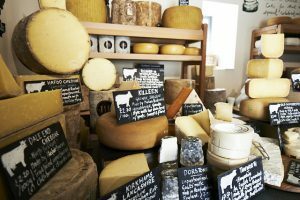 What’s the difference between unpasteurised and pasteurised cheese? Pasteurisation involves heating milk up to 72°C for 15 seconds, which will kill all the pathogens (bad bacteria) in the milk. It is carried out for food safety reasons by organisations involved in large milk- and cheese- processing/production. Unfortunately, the process of pasteurisation also destroys the flora (good bacteria) in the milk, and damages the fats, proteins and minerals. Small farmhouse producers that are allowed to do so, therefore, often choose to leave their milk raw (unpasteurised), as they have full confidence in the quality of their milk and their farming practices. This means the cheese they make more often than not tastes much better than if the milk was pasteurised, as the internal flora add flavour to the cheese. The unpasteurised milk leads to a more interesting cheese, unique to their farm. It is important to note, however, that ‘unpasteurised cheese’ does not mean ‘better cheese’. Using unpasteurised milk is just one of many factors that can make a great cheese: there are many more factors of equal, if not more, importance, amongst the foremost of which is the skill of the cheese maker (for example, even if you buy the best quality steak, the method of preparation and cooking will make all the difference to the flavour). What is farmhouse artisan cheese? That’s a difficult one, because these words have become corrupted by incorrect use. It has much to do with scale. In theory, farmhouse artisan cheese should be made by small-scale producers using milk from a known supply, ideally from their own farm, and with true connection to the land. Wyke Farms cheese-makers, for example, collect milk from 110 different farms and produce 15 million tonnes of Cheddar cheese a year. That’s not ‘farmhouse artisan cheese’ as far as The Courtyard Dairy is concerned! Farmhouse artisan cheese is often made from unpasteurised milk: small producers know their source of milk intimately, they know how it is produced, and they know it hasn’t travelled great distances to get to them. Industrial producers will use pasteurised milk to help them to produce a consistent, uniform, standard product. The Courtyard Dairy champions the ideals of small farmhouse production – the smallest farmer they work with has only twelve cows, the largest only around 120. The cheeses are still made on farms, often with unpasteurised milk and using the traditional methods (hand working the curd, cloth-binding, naturally rinded, etc.) that help to give the cheese a greater depth of flavour and create a product unique to each farm. Supporting this method of farming and cheese making helps keep alive the important food culture, methods of farming, rural local communities and the best cheeses in the world. I’m pregnant – which cheeses can I still enjoy? 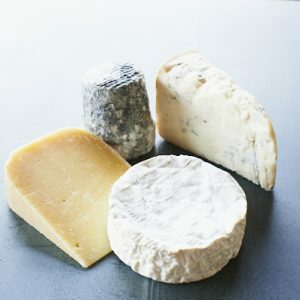 It’s worth remembering that cheese is one of the safest foodstuffs available, but to be on the safe side, if you are pregnant you should consume only long-aged hard cheeses and acidic cheese (such as cottage cheese), regardless of whether it is pasteurised or unpasteurised, and avoid soft, semi-hard and blue cheeses. This is in line with UK Government advice (NHS website, September 2013), which states, “Avoid mould-ripened soft cheeses, such as Brie, Camembert and others with a similar rind this includes mould-ripened soft cheese made with goats’ milk, and soft blue-veined cheeses, such as Danish blue, Gorgonzola and Roquefort. Cheeses like this are made with mould and can contain listeria bacteria that cause listeriosis. Although an infection with listeria is rare, even a mild form of this infection in a pregnant woman can lead to miscarriage, stillbirth or severe illness in a newborn baby.” This advice also applies to the very young, immunosuppressives and the very old. Hard cheese is OK to eat when pregnant because it has too little moisture, and acid cheese is too acidic, for the nasty bacteria to survive (when it forms a rind, however, this starts to break the acid down…). How will my cheese be sent out? Your order will be sent out packed in a Courtyard Dairy box, complete with secure filler and ice to keep it cold! Yes! You’ll be given the opportunity during the online ordering process. What happens if I’m out when my cheese is delivered? Your delivery will be left in your nominated safe place (e.g. porch, neighbour). Unfortunately, the delivery drivers are not allowed to call a third-party’s telephone number. What do I do if I haven’t received my cheese? Check with APC, stating your consignment number, to see the status of your mail order cheese package; you could do this at: www.apc-overnight.com or 0800 373737. If you still can’t find out, or if it has been delayed, please ring The Courtyard Dairy on 01729 823 291. Where can cheese be delivered? Anywhere in England, Wales and central Scotland. Please contact The Courtyard Dairy by telephone (01729 823 291) or email (andy.s@thecourtyarddairy.co.uk) if you live outside these areas and still want to place an order. When can you deliver and when should I order? Delivery can be made Tuesday – Friday throughout the week before 4.00 pm. Exceptions to this may be after bank holidays or for postal strikes. For an additional charge delivery can also be made on a Saturday. For more details contact The Courtyard Dairy. How much should cheese should I buy? 100g per person is about right for an addition to a main meal (for larger parties, reduce this to 70g). How should I compose a cheeseboard? Expect your guests to sample 3-5 cheeses at a dinner party. Its better to put out three decent pieces of cheese, rather than lots of small pieces. Try to offer a range of cheese styles, types and textures. The cheese selection boxes available from The Courtyard Dairy are specially made up to provide this balance. For full tips on composing a cheeseboard, see Learn About Cheese. What should I do with the rind? Moulds, yeasts and bacteria are encouraged to grow on and within cheese. These are often crucial to breakdown the fats, proteins and acid in order to achieve the right complexity of flavour and the ideal texture. Often they will form on the rind – this one the reasons why it is important to taste at least a little bit of the rind, so you can compare the flavours. A naturally occurring mould (now often artificially inoculated) that helps break down the cheese, thus developing interesting flavours and textures. Is there anything else I should know before ordering? Please check the Terms and Conditions for additional information on substitution of cheeses and cutting weights. Otherwise, hopefully you’ve got all the information you need to enable you to place your order.